The marketing for The Amazing Spider-Man 2 is fun (as they are designed to be) and my expectations were somewhat high going into the theater. But Spider-Man 2 left me a little empty, but I dare say, at least the visuals and action was fun. This review will start out non-spoiler filled, then, with ample warning, I chat about a few things in the film that might be considered solid movie spoilers from Spider-Man. All in all this latest Spider-Man franchise movie was more of an apathetic experience that confused me more than entertained my mind. It stuck to known commodities playing it safe with most of the story while making a joke out of others. It told a tale but I didn't feel like it developed more than a few situations to help the movie move ahead and set up Sony's plans for more Spidey movies. Don't get me wrong. Peter's story (angst) was well developed. 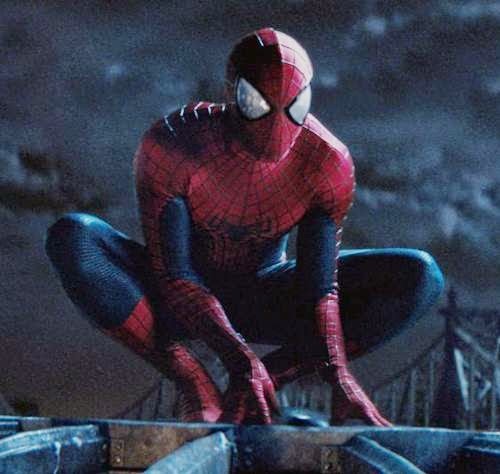 The novelty of the web-slinging was fun, and the action was fast and entertaining, but also predictable for a film that was designed to pander visually to the large format movie theater sound systems and 3D screens. The underlying story to the movie was Peter Parker (Andrew Garfield) and Gwen Stacy's (Emma Stone) relationship. And it does well to address the new direction Marc Webb takes the story, in regards to looking at the dark mystery of Peter's parents, his dad, who worked for OsCorp. And then the action came along and suddenly, the way things were interjected together, it caused me to ponder if something's afoul with the writing when the story is distracted by action and corniness. And how some of the criminally inclined show up with quick and seemingly hollow evolutions, well, that's surprising, considering the names on the writing credits include Alex Kurtzman and Roberto Orci. It was fun, but not as good as I would like. The Amazing Spider-Man 2 starts out with a nearly word for word recap (from the first movie) of Peter Parker's parents dropping him off at the doorstep of Ben and May (Sally Field). But then we see just how they met their demise after that point. All the while, Richard Parker is desperate to upload a file to a clandentstine destination. His trip is sidelined when he has to veer off to intercept a hijacking of an Oscorp armored vehicle. And this is when we meet the hard-to-understand Aleksei (Paul Giamatti) and start getting pummeled with Spidey's out-of-place corniness. I get needing to interject the classic Spidey humor/sarcasm into the story, but it seemed forced and out of place in this pursuit and way too often later on in the film. For example when Aleksei is plowing the tow-truck through downtown, cop cars, and crowds, and there's Spidey, joking with the guy while clinging to the outside of the door of the truck. My other confusing bit is how Spidey can't bust a front window of a tow-truck open, but can catch a city bus. But that's just me. That's sort of how this entire story goes, riddled with confusion and conflict, while moving forward with the story with Peter's relationships with Aunt May and Gwen Stacy Interjected with the bad guy of the moment. We learn about how, despite his promise to Gwen's father to stay away, he could not, and the continual haunting of what Peter's father was really up to when he dropped him off with Ben and May. Then you start interjecting the bad guys. First they start out as normal people, then later, as their mutated selves. Remember the Batman movies from Tim Burton and Joel Schumacher, where the bad guys were so over-the-top corny? Well, Jamie Foxx was given that task of playing the corny Max Dillon, who turns into maniacally angry Electro. 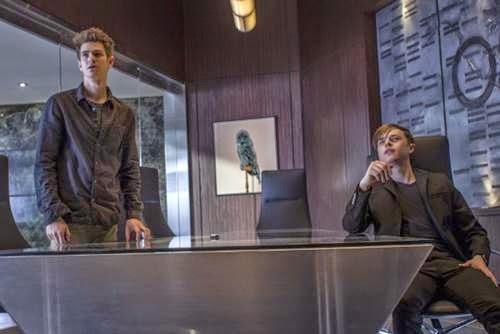 Then there was the nutty Dane DeHaan as Harry Osborn. In fact once Harry becomes the Green Goblin, he reminded me of when (Evil) Ed becomes a vampire in Fright Night (The original). But all in all, the movie was about Peter and Gwen dealing with Peter's guilt of not leaving her. Electro is the core nemesis for Peter. But there was so much to all the stories that they almost all diluted each other. One factor I did love about the movie was how the public and police have embraced Spider-Man. And though the Daily Bugle is a large part of Peter's life, it was nothing but a side-note in the story. And how despite his situations when fighting off bad guys, Spidey makes sure that the innocent people do not get harmed. That was admirable. Overall, it was an OK story and a fun action film, but there seemed to be a dependency on the action and some elements of the story came out of nowhere to make sure they happened. You'll see what I mean if you go. And after coming off the great Marvel movie, Captain America The Winter Soldier, where there was a ton of story development peppered within the action, well, this film falls short. And Marvel must be gritting their teeth in how the character is being handled. But I think what is truly lacking is no real world to develop stories around Spidey, versus the entire world of stories and characters that Marvel has built up around their own productions. To be honest, I hit up the 2D early-bird screening and I was pondering the time and money I dropped on the movie. (At least there's a Pizza My Heart next door.) I'd easily say that The Amazing Spider-Man 2 barely breaks into my popcorn 7 movie score. Barely. There were elements that pulled it up into the 7 scale. OH, and there is an after-credits bonus scene, so stick around. In this film some things took place that all fans were expecting while other things happened that sadly botched up the existence of some characters. That plus there seemed to be quick moments or events that only took place to further something else along. 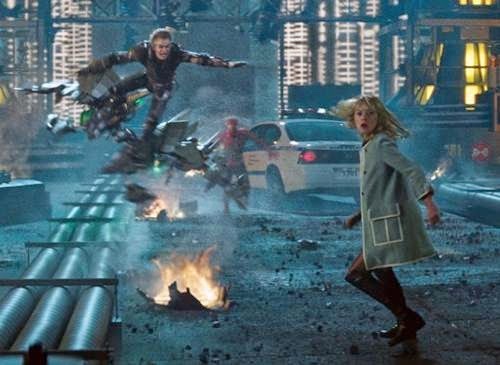 Electro is the MAIN bad guy in this film while the treatment of one of Spider-Man's primary foes, the Green Goblin, was a secondary event that only lasted a few minutes, just so he could fulfill a specific destiny. I presume he'll be returning. My confusion started when I noticed some of the marketing scenes missing from the movie. The scenes where Harry is telling Peter they have plans for him and that they've been watching him for a long time. My other confusion came when Spider-Man is being so glib while the guy he's chasing is charging his stolen truck through a crowded city. When Spider-Man saves Max Dillon, he does so during this truck chase, and Spidey takes several moments to chat Max up, all while the truck is hurtling through the city. I get trying to set up this first part of Max's relationship with Spider-Man, but this seemed so odd-ball in how they did this. And then we learn just how mentally unstable Max is later on. And Electro's inner kooky voice was pretty annoying. 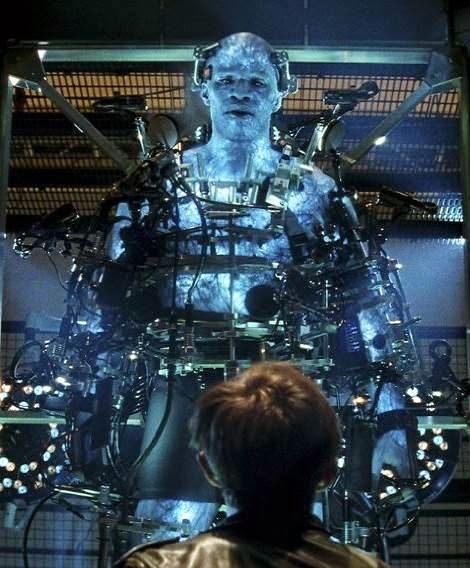 In one scene, Harry Osborn is saying that Spider-Man was created by experiments at OsCorp. HOW did he know this? How were those ideas pulled together by Harry? Did I forget or miss something in the previous film? The relationship between Harry and Peter felt glazed over and quickly delved into. Too quickly it felt. I liked the time spent with Harry in his story, which led up to his putting the Green Goblin suit on. But that time spent in the suit was so short lived that it was disappointing. For Harry to put on the suit and suddenly be expert in the use of the flying wing and the pumpkin bombs distracted me. Do you remember when New York set pics of Emma Stone popped up during production (June 2013) and she was wearing "that outfit" in which Gwen died in when the Green Goblin dropped her back in June of 1973? Yep. Not only was she wearing "that outfit" in which the comic character died in, so too, does our movie rendition of Gwen Stacy. In very much the same way... the Green Goblin dropping her and her dying in this fall. It was a moment that was confusing. Parker stops her from hitting the ground by snagging her with his webbing (which was an awesome visual) but in so doing, he snaps her neck from the sudden stop. This is when I was distracted or confused. Will she die or is this a movie ploy to keep us guessing. Dead or not... this went on for what felt like forever, but finally when Peter started to cry, I started to believe. The funeral sold it for me though. But wow. And had that set image not leaked online, this could have been one of the biggest, most dramatic moments in the Spider-Man movie franchise. For me, this explains why or how Mary Jane was pulled from this film... leaving room for her to show up in the future Sony installments. But wait, with all this Spider-Man spoiler chat, why have I not mentioned "The Rhino?" We see Aleksei Sytsevich, trying to steal an OsCorp truck for some unknown reason. Spidey captures him and embarrasses the crap out of him publicly. As the film winds down, Harry Osborn is in prison, coordinating the building of a small team of super criminals, and he and Mr. Fiers were wondering who their first team member would be. 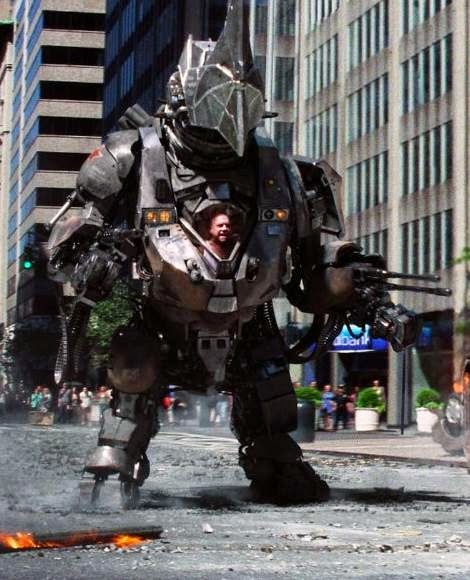 And they pick Aleksei, who later shows up in this ungainly suit of armor and he calls himself The Rhino. But it turns out that there is no fight. Spidey swings the manhole cover at Rhino and the movie ends before it makes contact. Seriously? After all the marketing about Giamatti being the Rhino and he turns out to be comic relief in the opening and the closing minute or two of the film. Dudes. Sony. That post-credits bonus scene was pretty interesting as Sony takes a page from Marvel's book of teasers in the credits. That Mystique trailer, per some sources, is a scene directly cut from X-Men: Days of Future Past. Nothing more. No hint or tease about any Spider-Man 3 news. Just a clip. On the bright side, unlike Raimi's version, the "screaming girl" syndrome is wonderfully missing in Webb's version. I seriously hated the constant, non-stop screaming from Watson.